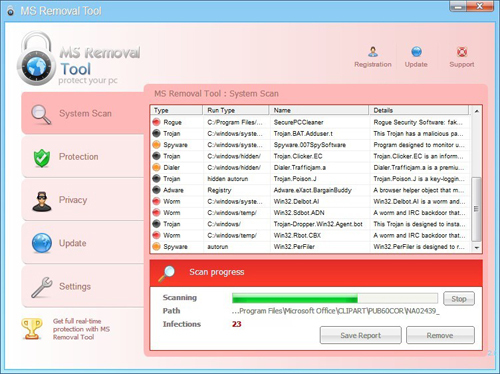 MS Recovery Tool is a newly released fake antivirus tool which has been designed by hackers to try and get you to buy the rogue upgrade to this software. Like many of the other malicious software programs we cover on this site, it’s going to install itself automatically and then try to get you to purchase the rogue upgrade to this software. We’ve found that although this program may appear to be legitimate, it is actually a total scam and should not be trusted at all. This tutorial is going to show you the best way to get rid of this virus in the most effective way from your system. What Is MS Recovery Tool? This is a malware (malicious software) infection, which has been created to try and get you to buy the rogue upgrade to the infection. The way it works is to install an actual piece of software onto your PC, and then use this program to both block your Internet settings & to stop Windows from being able to operate properly. We’ve found one of the most important factors in the way this virus works is to block your Internet Options, Task Manager & a number of other important programs. This program is a piece of software, which means that you have to be able to remove it in the most effective way in order to stop it from running. We’ve found that the best way to get rid of the program is to stop it from running, before deleting it completely from your computer.